Tulsa Project Theatre is the city's only Actor's Equity Association affiliated organization. Since producing its first performance of The Rocky Horror Show at the Hard Rock Hotel and Casino in 2010, Tulsa Project Theatre has become the city's only Actor's Equity Association, the union of professional actors and stage managers, affiliate. Last season TPT entered into an agreement with Tulsa Symphony and Local 94, the musician's union, to have the professional orchestra perform in all musical productions. In September 2014, the organization opened Academy Tulsa Project Theatre offering professional training in vocal, acting and stage performance. Academy classes are open to everyone and need-based scholarships are available courtesy of the Anne and Henry Zarrow Foundation and the Tulsa Project Theatre Board of Directors. TPT recently announced its sixth season and welcomed new Artistic Director, Matthew Alvin Brown. All productions will be held at the Tulsa Performing Arts Center. 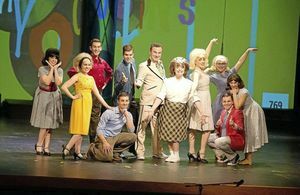 The season will open with The Who's Tommy in the Williams Theatre on September 16, 2016. In February 2017, the company will present Avenue Q in the Doenges Theatre. TPT returns to the Williams Theatre in June for its production of the popular Little Shop of Horrors. The Schoolhouse Theater, a nonprofit organization, is a venerable cultural center devoted to professional theater at the highest possible standard. Founded in 1976, the Arkansas Repertory Theatre is the state’s largest non-profit professional theatre company.